We all know that librarians wear many hats. For some this can be a bit confusing; however, I love all of the hats that I get to wear during a day in my library. I start my morning in a “circulation” cap as our girls use the library to finish last minute homework, catch up on last night’s Netflix binge, or attempt to wake up with some breakfast from our in-house café. Our book drop fills up and the day begins in our 5th-12th grade library and learning commons. Time to don the “research ranch” hat and “digital literacy” derby. My 6th-grade research workshop course can be a bit like taming wild horses. It is an opportunity for my students to discuss upcoming research projects, evaluate sources, argue the importance of acknowledgment and citation, as well as, dip their toes into some digital literacy activities. I enjoy helping to guide their reins as they learn to jump through the hoops of navigating research. During their rotating free period, my 5th-8th grade Library Leaders can be seen in the library. Beyond wearing the “point-person” pillbox myself, my Leaders dress in the hats of responsibility. They reshelve and organize books, pick up and clean the learning commons space, and even design library displays and announcements. 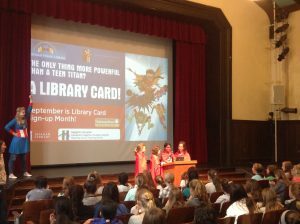 This week’s announcement was about Library Card Sign Up month, which had me wearing a Wonder Woman headdress- concealing my true identity! Thankfully, there is lunch in this story. Of course, it is accompanied by the Pop-Up Library pom-pom hat! Themed for each month- this week the Pop-Up includes books that follow our school theme of Courage, Character, and Kindness. I set up the Pop-Up just outside the dining hall so that students can browse after eating. My middle schoolers do not have scheduled library classes. So after buckling on my “brainstorming” hat, I have found monthly times to meet with each grade for Book Talks or themed activities to promote circulation and reading for fun. Today, I coordinated some Musical Books for my 5th graders. They enjoyed reading for three minutes, then when the music played passing the books until the music stopped, and they had a new book to read. Almost all of the 5th graders checked out a book afterward. 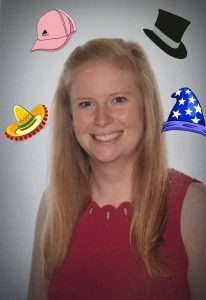 While I love all of my hats, I’m lucky to be able to show off my “secret talent” sombrero during my Book Art course. We discussed the great importance of the crane in Japanese culture and introduced the belief that one thousand paper cranes can grant the heart’s deepest wish. The first cranes they made were crumpled, lumpy, and not at all resembling the graceful bird. One student even frustratedly suggested that we make seagulls instead because clearly, that is what she had created. But these girls encouraged, helped, and coached each other through the instructions and one by one paper cranes began to emerge from the recycled book pages. 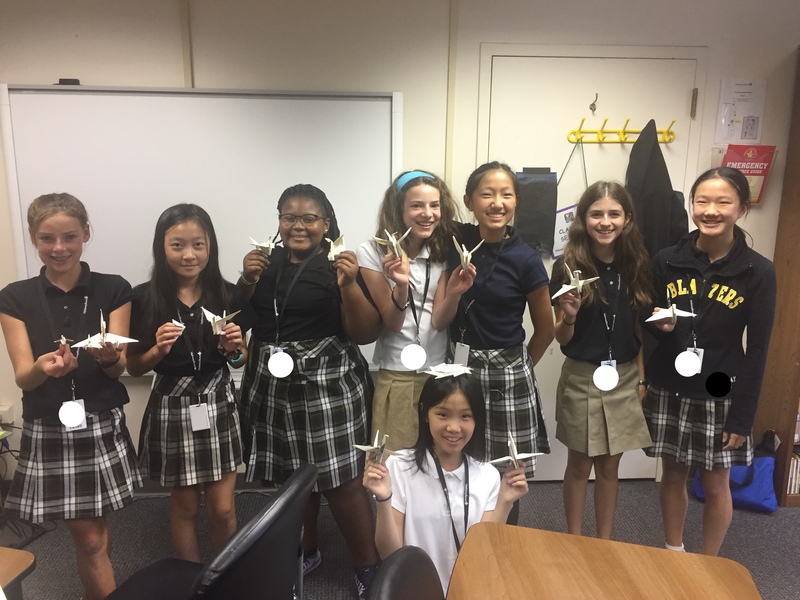 Our paper crane making project was coupled with the sound of the audiobook Sadako and the Thousand Paper Cranes by Eleanor Coerr. As the story took its course, my students were becoming more proficient at paper crane making and commented about feeling as if they too were helping Sadako create cranes. Although the story was a sad one, my students talked with each other about how making the cranes allowed them to feel at peace. Time to go home! Just kidding- today after school I sport my athletics cap as JV Golf coach! 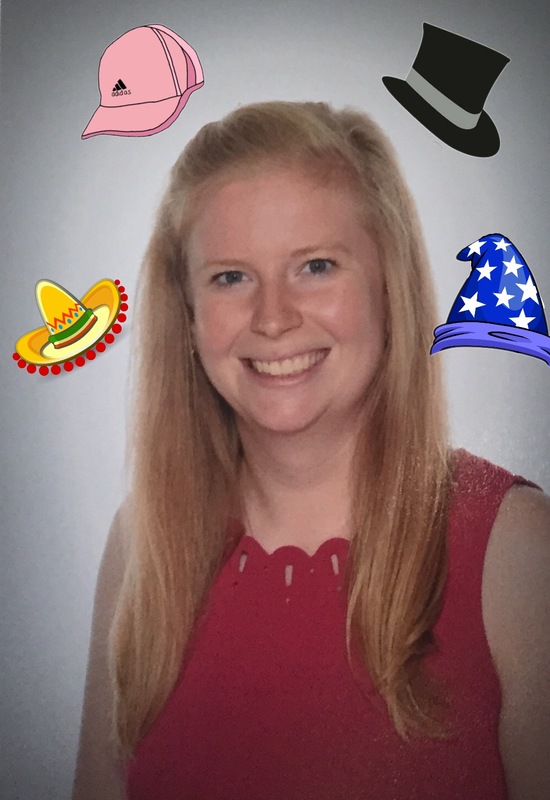 While from time to time I don’t have to quick-change into all of my hats, I really enjoy how busy my life as a Middle School Book Wizard- I mean- Librarian can be! I love seeing how people spend their days! That’s a lot of hats. Thanks for sharing. Great post! I would love to hear more about how you manage a shared space – do the students in your middle school feel just as comfortable using the library as the upper school students? We’re still grappling with the switch from a traditional library to a “learning commons” model (2 years later…), and how it works with middle and upper school using a combined space. Thanks for sharing about your day! If you can imagine our campus, the Middle School building and the Learning Commons (LC) are on opposite sides of the Upper School building, which means my 5th graders have to “confidently” walk through all the 12th graders to get to the front doors of the LC. We are in our second year of a shared learning commons (LC) as well. I like the LC model; it allows the space to be flexible and we are always in use. However, I also was hired “into” the model last year and didn’t have to make the switch from traditional. 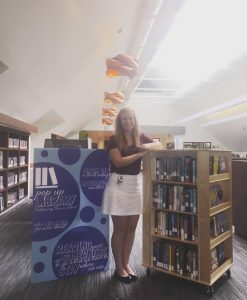 With the move from two traditional separate MS and US libraries to one LC in the back of my mind, my focus has been to create a physical space that encouraged MS students to visit. Working with the US librarian, we reorganized the collection moving the 5/6th Fiction closer to the front of the library and in its own little alcove; we merged all of the YA books and no longer have a designated 7/8th collection. We also decided to leave the juvenile nonfiction separated for easier access. Over the last year, I’ve been introducing these different sections when I host MS book activities in the space, which US students are welcome to stay and continue to work during. MS advisors have also bought their homerooms to the LC for board games and hot coco (we have a cafe). Both activities help build the atmosphere that the LC is a space for all students. The MS Library Leaders program also gave ownership to the MS students; they are proud of their LC space and help keep it nice. I’m still working on making my students more comfortable in the space. While they do often request pop-up libraries so they don’t have to “walk sooooo far away” to get a book, I’m always looking for more excuses to get them into the LC! Thanks so much for the reply! I am loving some of your suggestions – really intrigued by the idea of moving your 5/6th collection closer to the front of the library. Ours is currently at the back and I didn’t even think about how many extra steps that added for our middle schoolers. Thanks again!